So, here’s another mad kitchen-science experiment that has been a consistent success in our home – creamy coconut cordial. A few years ago, my housemate and I experimented with a very intriguing recipe that we found from TheKitchn. While we’d made cordials, tinctures, and elixirs before, we had never tried doing a milk-based booze drink from scratch. It takes a minute to deal with the idea of making boozy drinks with milk. Milk curdles and goes all chunky when you add it to straight alcohol! Curdles are bad….right? Not in this case! Don’t worry…there is a lot of straining involved in the final stages of the process to get the milk proteins free from the booze for a more pleasant drinking experience. Don’t like coconut? Add any flavorings you like! The first time we tried this recipe, we happened to have a fresh coconut which we chopped open, cut apart, and then roasted the tender flesh to add to the milk liqueur. 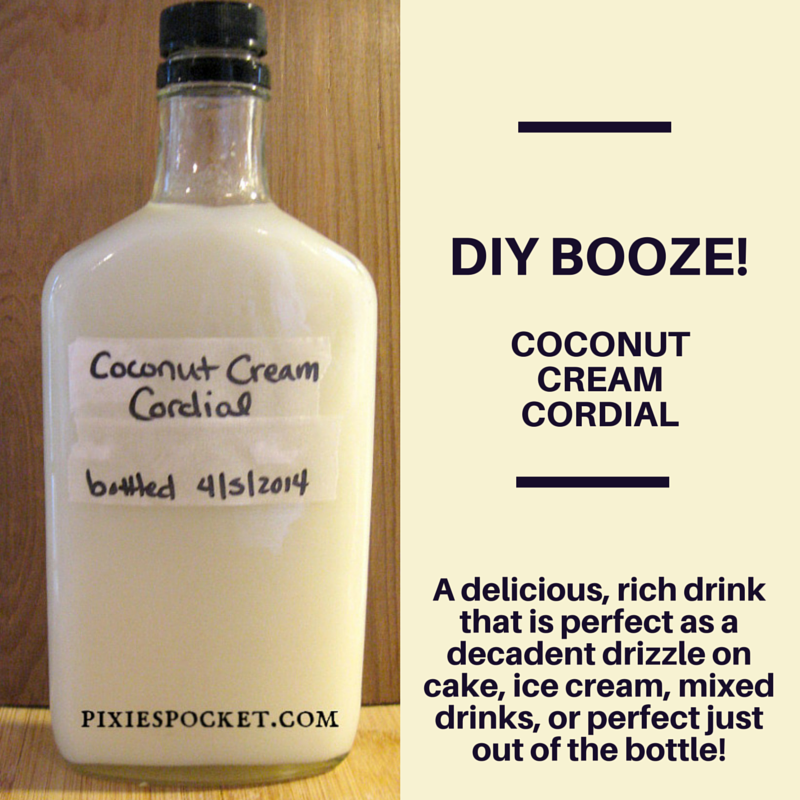 But that is quite a bit of work, so I have discovered an easier way to recreate our delicious, coconutty twist on the milk liqueur recipe! This recipe will result in only about 1 cup or so of booze…but it is a great place to start to learn the process. If you enjoy it, just up the amounts! It is always equal part vodka, milk, and sugar…the rest is up to your tastes. Grab a jar that will fit 4 cups and pour in the dried coconut flakes. Add in vodka, milk, and sugar until the jar is full and the flakes are covered. Put a lid on the jar and give it a really good shake! Set it in a dark cabinet for ten days and leave it alone. It will curdle, separate, and look disgusting, but I promise it will all turn out fine. Ready? Get a few jars and a funnel, and cheesecloth. Strain the liquid over and over and over from jar to jar until there are no longer any milk proteins and the cordial is rather clear. The coconut doesn’t go all the way clear due to the oil content, as you can see in the image. Sounds interesting. I’ve done something really similar to this using coconut water/milk, but not cow’s milk. I’ll have to give this a try, thanks for sharing! Oooh, I’ll have to try playing with coconut milk to see what happens! The milk liqueur thing is odd but awesome – and takes any flavors well! Try an orange slice and vanilla bean, or berries, instead of coconut for a totally different experience! Did the coconut milk recipe turn out? Where did you find the recipe? I was just thinking about how I’d like to make a non-cow-milk version of this! Looks wonderful. Wow, what an intriguing recipe! I bet a shot of this would be amazing in a cup of strong, hot spiced chai. Wow, that’s a GREAT idea…can’t believe I haven’t tried that before!!! Would it be possible to use Erythritol or Xylitol in place of the sugar? That’s a good question, Tet! I don’t use those myself, so haven’t tested it out. In this recipe, the vodka *should* be sufficient enough to keep it all from going bad, but I don’t know for sure. I’d also keep in mind that you might not want to do equal parts, since xylitol is a little sweeter than sugar, isn’t it? Sounds like a good excuse for an experiment!